Have any of you played a game of crazy crosses? You haven't? Come, let us play. What do you get if you cross the African Dictator Idi Amin and the Indian Scientist CV Raman? Well, the answer is..... The Idi Amin of Malleshwaram. What the hell is that now you may ask. To find the answer I shall have to ask you to step into this time machine with me and travel three decades back in time. We are in a cozy little middle class locality in a city that was known as India' garden city or alternatively as the pensioner's paradise. Malleshwaram is the name of this locality. Let us zoom down further to one particular house in this locality. A house in the first floor. But let us not enter the house. For most of the events we shall witness are going to happen in the corridor outside the house. So let us just hang on in the corridor, shall we? However let us go and find the one who we started out looking for - the Idi Amin of Malleshwaram. So he we are at the corridor, looking down from over the parapet wall. Now let us turn to our right and walk a few steps till we will reach a flight of stairs. Let us climb the stairs. We are now in a corridor very similar to the one we left. We turn to our left and walk till we reach a door. The door is closed. There is a calling bell. Wait! Before you give in to the impulse to the ring bell, listen to what I have to say. For this is the lair where dwells the deadly Idi Amin of Malleshwaram. So who is he and what is the deal with him? He is the owner of six houses, all of them in a single building, two on each floor. He stays in one and has rented out the other five. All that is fine but what is the CV Raman connection and more importantly the Idi Amin connection you bark at me impatiently. Let me answer one at a time. The CV Raman connection is the easy one for that happens to be his name. However any similarities with the scientist begins and ends with the name. 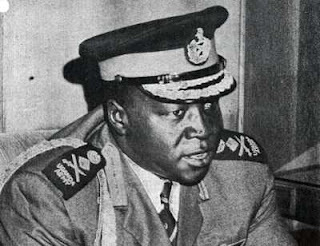 In terms of personality, he takes more after Idi Amin. Lord and Master of his villa he is, like Idi Amin was of his country. With an iron hand he reigns- over his family and his tenants. Unbeknownst to the great dictator, rebellion brews in the floor below. Two are the heroes who stand against him. Dozen years is all the years of age they have between them, six each. The two, sons of childhood friends, are inseparable friends themselves like their fathers before them. Many are the adventures they have had. But that is a yarn for another day. Today, they are in the corridor, right in front of us, oblivious of our ethereal presence. They seem to be discussing something serious. "His atrocities are crossing the limits. It is time we put an end to his evil reign." Even at such a young age, this boy has all markings of a great leader. There is fire and iron in his spirit. "But what can we possibly do against him? Even our parents meekly bow down to him?" The second boy clearly does not possess the spirit of the warrior. "Our parents! You want to be like our parents?" His fiery diatribe against their parents is interrupted by the sound of footsteps. The words freeze in Gautham's throat for right in front of them stands none other than the man himself - C V Raman, the Idi Amin of Malleshwaram. Unperturbed he turns towards the man and gives a smart salute. "Good afternoon, Sir." The despot gives a nod of acknowledgement to Gautham and turns to the other boy who has a scowl on his face. "Learn some manners from you friend, boy." He gives the boy a cuff on his ear and proceeds up the stairs towards his home. Before he can speak up, Gautham gives his friend a conspiratorial wink. "He can not be allowed to discover our plot prematurely, can he? So we have to grin and bear it till the time is ripe. And when the time is right, we shall strike. And strike we shall when he expects it the least." We now have to get back into our time machine and move ahead a few days. For in the following days plan after plan will be made to overthrow the evil despot only to be discarded. Let us skip those torturous days and move straight on ahead to the day of deliverance. Again they are in the corridor and Gautham is the one speaking. "The key to his power is the fear he strikes in his tenants' hearts. One blow is all that is required. One blow right in the open in front of all his tenants. That will show them his vulnerability and encourage them to rise against him and overthrow him." He then rolls out his plan in detail. The other boy, as usual is skeptical. "Why do you have to be negative about everything? You need to have faith in something. Don't be a weeny like your father. My father says your father used to be like this all the time. I am sure you can do better than him." The other boy reluctantly agrees. Let us move on ahead to the fateful day the plan is to be executed. The two are standing near the parapet wall and looking down. Raman is down there talking with one of the ground floor tenants- a sturdy woman balancing a baby on her hip. Something wet and frothy lands on the baby's head. The baby breaks out into furious wails and the mother raises her head just in time to see the head of the culprit disappear down the parapet wall. Heaven knows no fury like a woman scorned. And what greater way to scorn a woman than to spit at her little baby, her darling, the light of her life! The two miscreants run like the wind and find refuge in their respective homes. But home too is no haven of safety for she knows where the one whose spittle defiled her little angel's beautiful hair resides. Soon lightning strikes the boy's home. It is closely followed by incessant claps of rolling thunder. A woman scorned need not necessarily be just of one kind. Another kind can be the one shamed by her child's misdeeds. The first woman has blown off her steam and retreated. Now is the turn of the second - the mother of the boy in question. The misbehaving boy has to be taught a lesson. The gas stove is lit. A ladle is heated. The boy is dragged out from the corner where he is cowering in fear. Shrieks are heard as the heated ladle sears the flesh of his forearm. Thus the rebellion against the Idi Amin of Malleshwaram was quelled for ever. The revolt had failed miserably. Of the two shots that were supposed to be fired for the cause of freedom, one had found the wrong target. The other had not been fired at all. A leader had deserted his troops and fled from scene of battle. A foot soldier had been wounded in battle and left nursing not one but two wounds. The one on his hand would soon heal but not the one in his heart - his first experience of betrayal of trust. .this was more sad, Karthik! Poor little boy! I have been battling with the Idi Amins of the March (notice the similarity between Idi and Ides) and getting none the better. I quite enjoyed your story though. Shall we hear more about the despot? Ha Ha - The Idi Amins of March! Nice one. Thanks as always for your words of confidence in my writing, Umashankar. You may hear of him in the passing - there are a couple of more good stories from that period of my life I think. Yeah Suresh - had to endure that tribe right from early childhood. Ha Ha - come to think of it, yes. He definitely must have - I am not in touch though his father is still in touch with mine. I wanted to have nothing to do with him after that phase in life. Sir CV must be rolling in his 'resting place!' Nicely done, TF. This is awesome. Your childhood is so 'real'. Loved reading this a lot.